The peach appears to have originated in China, where it achieved cult-like status because it was symbol of immortality among poets, sculptors, and painters. This is despite the fact that the peach tree has a short lifespan and most orchards must be replaced after a decade of production. It was Hernán Cortés, the conqueror of Mexico and later its agricultural pioneer, who introduced peaches into Mexico as early as 1530. From there, peaches followed the Spanish settlers to St. Augustine, Florida in 1565 and to Santa Fe around 1600. The Creek and Seminole inhabitants of Florida adopted the peaches and they were passed from tribe to tribe and spread throughout North America faster than the white settlers. At the same time, the cultivated trees escaped into the landscape and William Penn observed wild, Indian peaches as far north as Philadelphia in 1683. 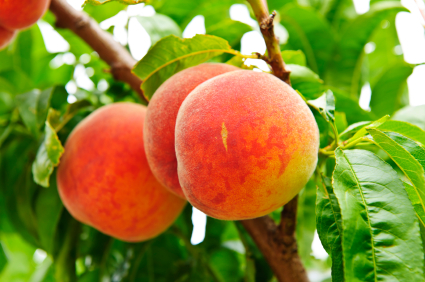 By the mid-1700s, peaches were so plentiful in the United States that botanists thought of them as native fruits. 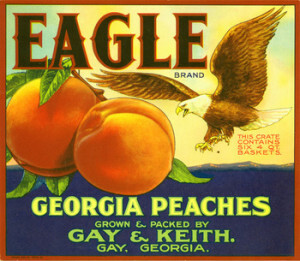 Peaches were beloved by southerners. 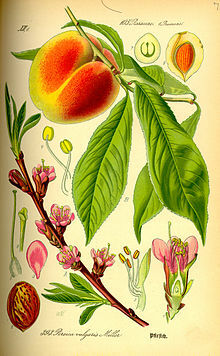 Specific peach varieties were rarely mentioned in eighteenth-century Virginia literature, and George Washington only noted two varieties for his Mount Vernon orchard. But Thomas Jefferson cultivated more than thirty-eight in his South Orchard alone. The peach was premier fruit at Monticello, and undoubtedly Jefferson’s favorite fruit; he wrote “We abound in the luxury of peaches.” At Monticello the cooks made mobby, which was peach juice that was later distilled into brandy. Jefferson recorded that “20 bushes of peaches will make 75 galls. 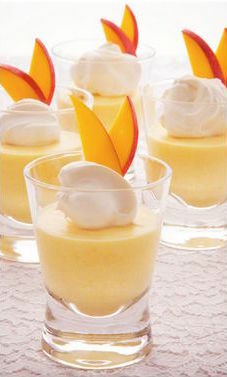 of mobby.” Of course, fresh peaches were used in desserts like a topping for ice cream and were made into preserves. “Peach chips” were sliced from peeled peaches, boiled, sugared, and sun-dried. In 1794, Jefferson had his slaves plant 900 peach trees, which also made excellent firewood from the dead wood pruned each winter. “I am endeavoring to make a collection of the choicest kind of peaches for Monticello,” he wrote to a friend in 1807. Probably the most famous peach dish is Peach Melba, a classic dessert invented in 1892 by the French chef Auguste Escoffier at the Savoy Hotel in London to honor the Australian soprano, Nellie Melba. It combines two popular summer fruits: peaches and raspberry sauce accompanying vanilla ice cream. In 1892, Nellie was performing in Wagner’s opera Lohengrin at Covent Garden. The Duke of Orléans gave a dinner party to celebrate her triumph, and for the occasion Escoffier created a new dessert, peaches resting rested on a bed of vanilla ice cream and which were topped with spun sugar. In 1900, Escoffier created a new version of the dessert for the opening of the Carlton Hotel, where he was the new head chef. Instead of spun sugar, he topped the peaches with raspberry purée, and that’s the classic Peach Melba that lives on today. Despite a plethora of peaches at Monticello, American farmers did not begin commercial production until the 19th century in Maryland, Delaware, Georgia, and finally Virginia. As of 2010, peaches are commercially produced in 28 states. The top four states in peach production are California (with 65 percent of production), South Carolina, Georgia, and New Jersey. California is a significant producer of both fresh and processed peaches, while South Carolina and Georgia mainly produce fresh peaches. Today, peaches are the second-largest commercial fruit crop in the States, second only to apples. 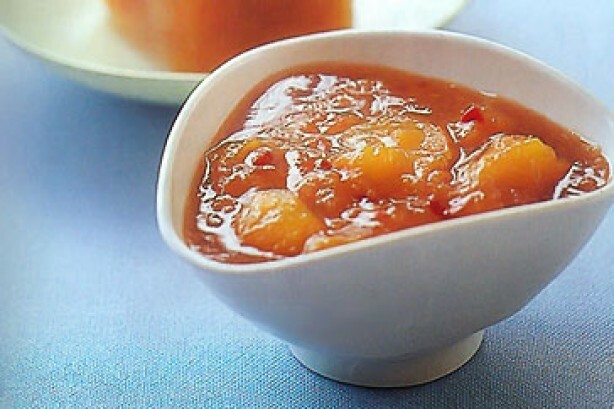 Spicing up peaches with chile peppers became popular during the chile pepper craze that gained momentum after the launching of Chile Pepper magazine in 1987 and the subsequent cookbooks by Nancy Gerlach and myself that popularized chiles into mainstream America. During the publicity that surrounded the first superhot chile, the habanero in the early ’90s, cooks realized that the chinense species with the floral and fruity overtones of its pods, were the perfect peppers to complement fruits, as you will see below. This collection of recipes is taken from my archives. Habanero chiles work particularly well with fruits, so these daiquiris will delight chileheads, who will probably suggest adding more habanero to the blender! For a nonalcoholic version of this drink, substitute pineapple juice for the rum and decrease the sugar to 3 tablespoons. 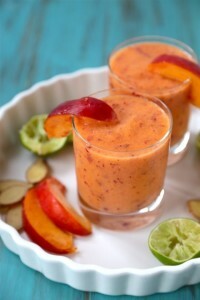 In a blender, combine the peaches, lime juice, and chile and purée. Add the rum, sugar, and crushed ice and purée until smooth. Pour into stemmed glasses and garnish with mint sprigs. Central Texas is Hill Country, which produces the habaneros, pecans, and peaches that are used in this recipe. This cooked salsa is an example of the New Southwestern style of cooking, and it would accompany grilled chicken or fish. In a saucepan, dissolve the sugar in the orange juice and vinegar. Add the chile, cinnamon, cumin, and orange peel. Bring to a boil, reduce the heat and simmer for 20 minutes until it becomes a thick syrup. Discard the cinnamon, add the peaches, and simmer for 5 minutes. 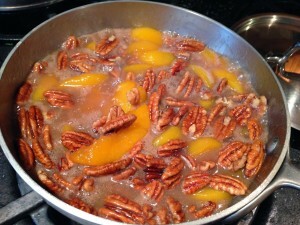 Stir in the pecans and heat for an additional minute before serving. The word chutney comes from the Sanskrit word chatni, and in India refers to relishes that are used to accent other dishes. They can be sweet, sour, hot, or mild. This is a hot and sweet version. Serve with curries or other Indian goods. Combine all the ingredients in a saucepan, bring to a boil, reduce the heat and simmer for 45 minutes to an hour, or until the sauce is thick, stirring occasionally and skimming off any foam that forms. Cool, place in jars, and refrigerate. Variation: Puree the mixture for a smoother chutney. Do not peel the peaches. The Chipotle chile adds a nice hint of heat and smoke to this spectacular way to end a great meal off the grill. An interesting variation is to substitute Stilton cheese for the goat cheese. Combine the brown sugar, lime juice, and vinegar in a small saucepan and simmer for 10 minutes to thicken slightly. Remove from the heat, allow to cool, add the peaches, and marinate for an additional 20 minutes. . In a small bowl, mix the cheeses together and let sit at room temperature for 30 minutes to blend the flavors. To make the puree, slightly thaw the raspberries. Place all the ingredients in a blender or food processor and puree until smooth. Remove the peaches from the marinade and place them in a grill basket with handles. Grill them flesh side down over a medium-hot fire. Grill for 2 to 3 minutes until the grill marks show. Turn and grill until the peaches are soft. To serve, spoon some of the raspberry puree on a dessert plate, place the peach cut side up on the sauce. Put a dollop of cheese in the center of the peach and top with additional puree, and garnish with the walnuts. Here’s a fruit-dominated mousse if there was one. Also dominating is the soft burn of the chile powder as it’s blended into the whipped cream. This recipe is extremely simple to make. In a large bowl, whip the cream with sugar, vanilla, and chile powder until stiff peaks form. Fold in the remaining ingredients. Spoon the mixture into a serving bowl and chill for at least 3 hours. Serve garnished with plum and peach slices. Peaches are the leading deciduous fruit crop grown in Texas and it is estimated that there are more than one million trees planted statewide. Average annual production exceeds one million bushels. Some of the best peaches I’ve ever eaten are grown in the Hill Country outside of Austin and San Antonio. They are so important there that a Hill Country Fruit Council has been established to guide tourists to the best orchards. Here’s how to use them in a wonderful dessert. 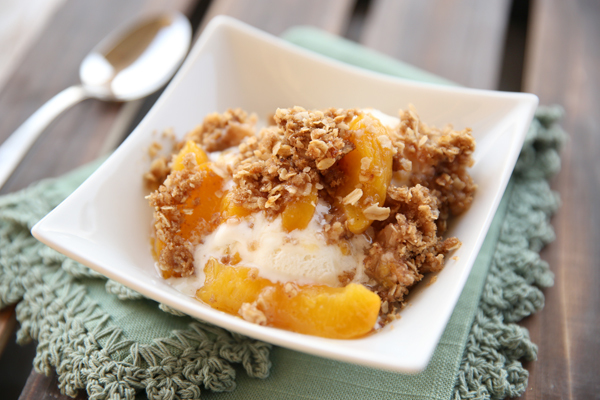 In a bowl, toss the peaches with the lemon juice and almond extract and then place them in a 9 by 13 inch baking dish. In another bowl, combine the sugar, flour, oats, pecans, and coconut and then stir in the butter and almond extract. Spread this mixture over the peaches and sprinkle it with nutmeg and cayenne. Bake in a 350 degree oven for 45 to 60 minutes, or until the top is golden brown. In a small saucepan, simmer the cream until reduced to about 1 cup. In a large skillet or griddle, roast the garlic and onion over high heat, turning several times, until the garlic is dark on all sides and somewhat softened and the onion is partly charred. Add the tomatoes and roast until the skins start to come off. Peel the garlic, onions, and tomatoes and put them in a blender. (It’s okay if a few charred bits get into the mixture.) Purée on medium speed until smooth. Add the cream and purée until smooth. Season with salt to taste and keep warm. To make the tomato salsa, in a small saucepan, simmer the cream until reduced to about 1 cup. In a large skillet or griddle, roast the garlic cloves and the onion over high heat, turning several times, until the garlic is dark on all sides and somewhat softened, and the onion is partly charred. Add the tomatoes and roast until the skins start coming off. Peel the garlic, onions, and tomatoes and place into a blender. It’s okay if a few charred bits get into the mixture. Puree on medium speed until smooth. Add the cream and repeat. Season with salt to taste and keep warm. Preheat the oven to 350°F (180°C). Grease a baking sheet. To make the stuffed poblanos, melt the butter in a sauce pan, add the onion and garlic and sauté until the onion is soft. Add the olives and the dried fruits and continue to sautée until the fruits are soft. Add the spices and cook for 1 more minute. Adjust taste for seasoning and add salt as needed. Carefully fill the chiles with the mixture and bake on a greased baking sheet for 7 minutes at 350 degrees F.
To serve, spoon the tomato salsa on individual plates and place one chile on each plate, over the salsa.